This villa is located in a peaceful residential area called Faro Park which is approximately 3 kms out of Playa Blanca itself but situated close to the beautiful sea front promenade towards the lighthouse that runs into Playa Blanca, Lanzarote. There are a row of local amenities (2 provision stores, bars, restaurants, cafes etc.) around a 15 minute walk away, which makes this area quite self-sufficient but the main beaches and amenities are around a 40-50 minute walk (although another beautiful row of bars/restaurants and some sandy coves are only about a 25 minute walk away). That said, there is also a very efficient bus service that runs on a regular basis every 30 mins, together with easy access to taxis which can take you in to Playa Blanca or the Marina Rubicon within a matter of a few minutes. 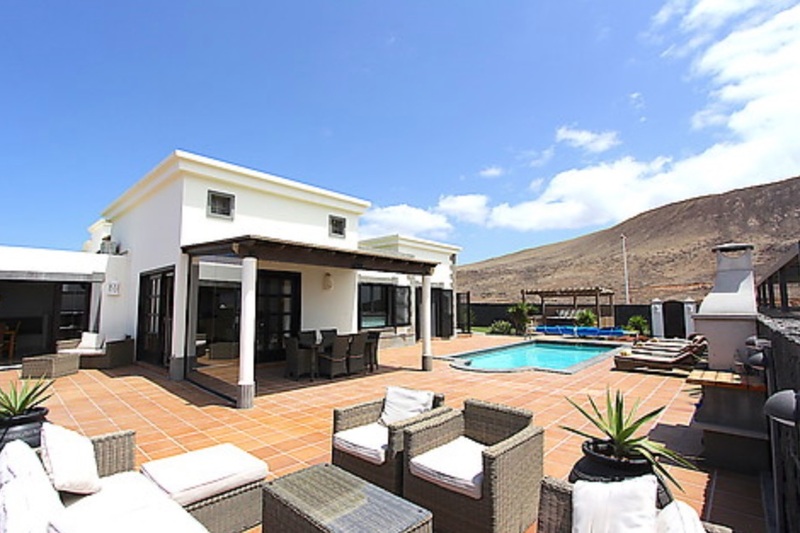 The airport is approximately 35 minutes drive from this area.This beautiful Villa, with hot tub, is located in Playa Blanca and has both sea and mountain views. The Villa has everything you could want for a fabulous family holiday. Equipped with a private heated pool, Jacuzzi hot tub, a children’s play area and internal games room making there something for everyone. From the lower level you enter the Villa and on your right there is a games room which has coin operated air conditioning, with a pool table, ping pong table and Fusbol table, together with a flat screen TV with Play station 3. There is also a darts board so care needs to be taken for younger children. The next door on the ground level takes you to the self contained apartment with a King size bed with a portable screen separating the bunk beds with a double on the bottom and a single bed on top. There is a kitchenette with a sink, fridge, microwave, kettle and toaster together with a dining table and 4 chairs. A separate bathroom which consists of a walk in shower, sink and toilet. Two fans are provided for this area. PLEASE NOTE THAT THE APARTMENT WILL ONLY BE AVAILABLE FOR PARTIES OF 5 OR MORE. The main floor is accessed via the marble stairs (stair gate available) up to the lounge and kitchen area. There are two further bedrooms on this level, the master bedroom with Kingsize bed and an en-suite bathroom with a walk in shower, toilet and sink with the safe under. There is coin operated air conditioning in this bedroom and patio doors giving access to the pool area. The twin room is next door with windows overlooking the pool area with twin beds and coin operated air conditioning. The bathroom is opposite and has a shower over the bath, toilet and sink. In the kitchen you will find this fully equipped with oven/hob, fridge/freezer, dishwasher, microwave, kettle, toaster and coffe maker. The washing machine can be located in the utility room together with the iron and board. There is a hair dryer in all 3 bedrooms for your use. The beautiful airy lounge has a flat screen TV with a full SKY system, a DVD player and a bluetooth CD player. Patio doors lead to the pool area. From the kitchen you will find the dining area with patio doors again leading to the pool area. The owners have provided a pool safety fence a childs safety stair gate and a cot and high chair that can be erected for your use if you have little ones. You would need to request these on the booking form so they can be installed by the Villa Managers for your arrival otherwise we will assume you do not require them. Outside you will find the Canarian coal BBQ and tools for the chef in the house. The 8m x 4m swimming pool is electrically heated and salt chlorinated and there are 6 rattan sun loungers with cushions for relaxing, pool towels are supplied for your use. A Jacuzzi hot tub has been installed for soaking in whilst watching the sun go down over the ocean. The opposite end of the pool you will find the ‘Gin Corner’pergola area with a comfy sofa to relax with that Gin and Tonic or your tipple of choice. To the side you will find the childrens play area with artificial grass for the little ones to crawl around on. – NO PARTIES OF ADULTS ALLOWED 30 YEARS OF AGE OR YOUNGER. – NO SINGLE GENDER PARTIES ALLOWED REGARDLESS OF AGE. ** PLEASE NOTE THAT HALF TERM DATES AS DETAILED ABOVE ARE CHARGED AT HIGH SEASON. ** PLEASE NOTE THAT DURING HIGH AND PEAK SEASON THE MINIMUM OCCUPANCY IS 6 PEOPLE. SMALLER PARTIES ARE ACCEPTED BUT WILL BE CHARGED FOR 6 PEOPLE. 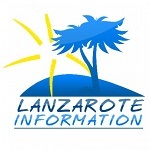 – THERE IS A £150 DAMAGE BOND PAYABLE WITH THIS VILLA. – FIRST CHILD UNDER THE AGE OF 2 STAYS FREE. Please note the rates shown are for 4 persons per week. Please add £100 per additional person per week up to a maximum of 9 in total. A cot and high chair are also available on request.